According to Lykins, New Jersey’s first seaside resort town was about thirty miles north of Atlantic City. A tiny, windswept place called Tucker’s Island, it seems notable mainly for the bad luck that befell its residents. Children died in unusually large numbers and houses fell into the sea as the island steadily shrank. By 1952, it had disappeared completely. When I left New York that afternoon, it was warm and the sun was out. In Philly a guy bummed a cigarette off of me and then burped the alphabet, which I think is Philly for “Thank You.” By the time I got to Jersey, the hot mic recording of Trump and Billy Bush had been out for hours and high-ranking Republicans were starting to jump ship. 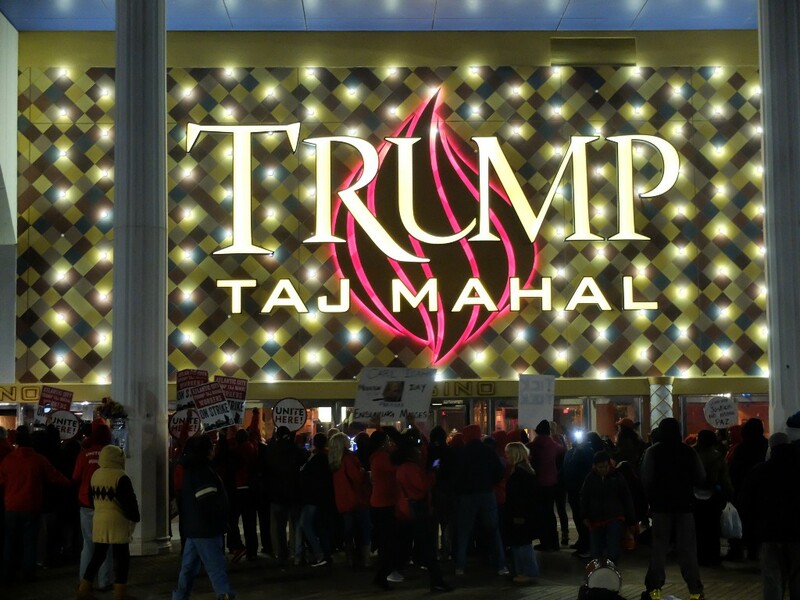 It was the last weekend of the Trump Taj Mahal and Atlantic City had a little less than a month to come up with a budget agreement that would avoid a state takeover. 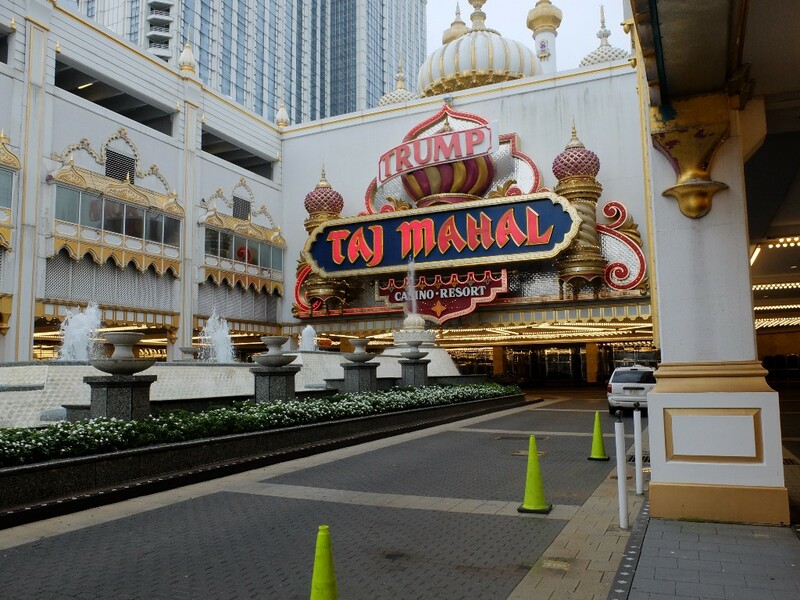 The Trump Taj Mahal opened twenty-six years ago, on April 2, 1990. By now you’ve probably seen the GIF — Trump standing next to a tacky magic lantern, waving in the direction of the Showboat casino. 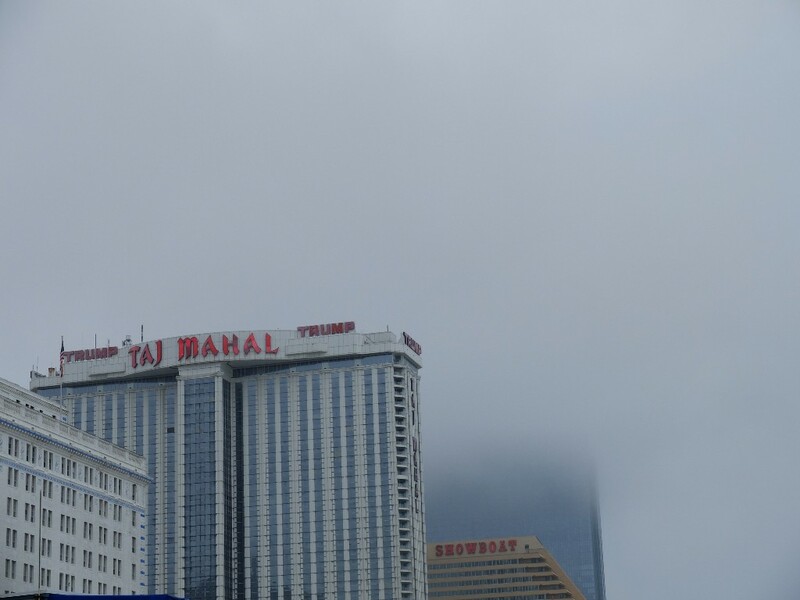 Financed with junk bonds that carried impossibly high interest rates, the Taj had financial problems even when Atlantic City was booming and quickly sank when casino revenue began to dry up. Trump’s close friend, Carl Icahn, bought the casino out of bankruptcy court in 2014, but refused to reinstate workers’ healthcare and benefits, and since then he’s been locked in a battle with UNITE Here Local 54, which represents about 1,000 employees. On one of the Taj Mahal’s boardwalk columns is a makeshift memorial to Esau Ivon Madrid, a cafeteria attendant who died of a heart attack a few weeks into the strike. According to union officials, Madrid was sending about eighty percent of his income to his children in Honduras and didn’t qualify for Medicaid. Gregory Natale Sr., a bartender who’s worked at the Taj since 1990, takes fourteen pills a day after he had a heart attack at his work station in 2012. Condos is a cancer survivor. Unions have been a mainstay in Atlantic City’s casinos and they’re becoming increasingly prevalent in New York City hotels, but generally speaking, service and hospitality jobs that provide benefits are pretty hard to come by. According to the U.S. News & World Report, seven out of ten of the lowest paying jobs are in food service, and it’s not an industry that gets easier as you age, especially for women. It doesn’t matter how good you are at your job — getting hired as a cocktail waitress past forty is nearly impossible. A union is your best chance at survival, let alone stability. At the center of the building, three enormous chandeliers hung over a golden elevator. The only person in sight that day was a woman in an Ocean City, Maryland sweatshirt, who put her cigarette out in her drink and spat on the floor. A security guard stood stared blankly at a Wonder Woman game. Inside the casino newsstand, they were still selling Trump t-shirts and bobbleheads. 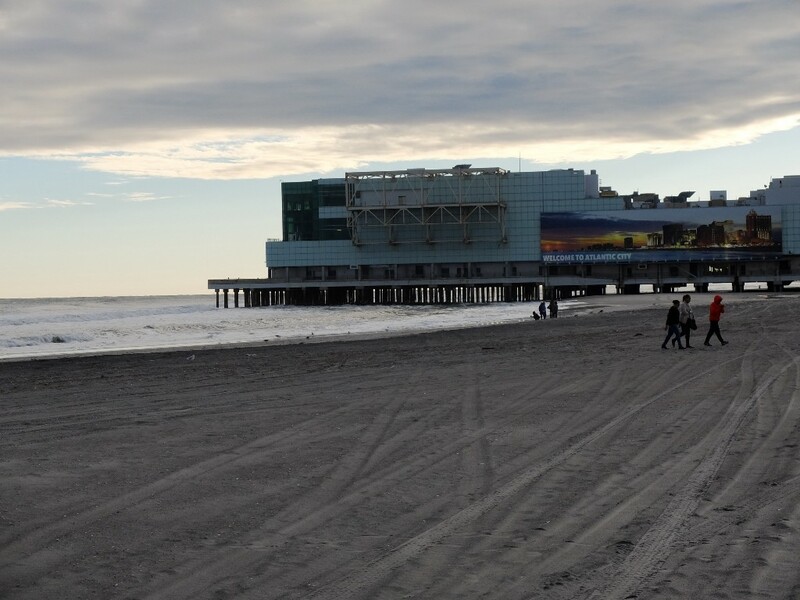 The boardwalk is especially quiet in the off season. 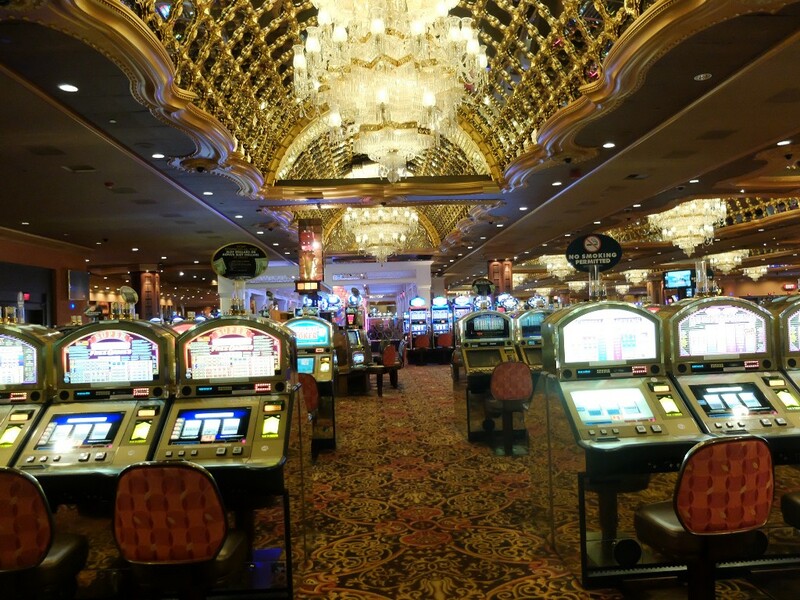 Without ambient noise, all that could be heard were ads and music, piped out from a casino or a bar or a Cash-for-Gold place. Televisions along the railing kept playing an abbreviated, rockabilly cover of Springsteen’s “Atlantic City” that obfuscates the fact that the actual song is very sad. Outside the front entrance to the Taj Mahal, a bunch of severed fish heads were scattered around the sidewalk. They didn’t seem prominently displayed enough to be the work of protesters, they were just sort of there. I was introduced to three different people over the weekend, each of whom I was assured was Mister Atlantic City. As in, “Oh, you gotta talk to this guy, he knows everything.” One was a bartender, one was a limo driver, and one of them I think just hung out on a bench most of the time. None of them was voting for Trump, all of them agreed the issues he’d been campaigning on were insane, but as far as his effect on their hometown — they shrugged. 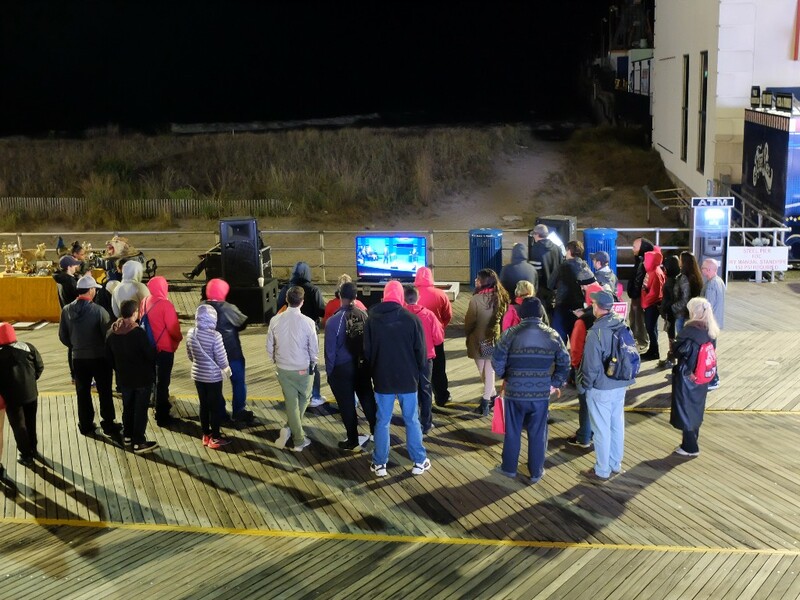 The last night of the Trump Taj, a Bon Jovi cover band played on the boardwalk across from the picketers. No one seemed to know who was responsible for booking the band. It wasn’t organized by the hotel or the union and frankly it seemed very cruel. These people were all about to lose their jobs, what kind of monster would make them listen to Bon Jovi. Inside the casino, the debate began, playing on mute over the handful of gamblers inside. No one seemed to care. Someone had set up a flatscreen TV and the strikers were huddled around it, watching Trump squint into the camera. A man dressed as Neil Diamond walked up, wearing bell bottoms and a turquoise, sequined shirt. “It’s just such a small wig and I have such a big head,” I heard him tell someone. They were with Triumph the Comic Insult Dog, whose handlers were responsible for the Bon Jovi cover band and the TV. He talked to some strikers and made a joke about a toilet. (“The Oval Office” was the punch line.) Off to the side, Neil Diamond checked his hair in the mirror. The strikers mostly just looked cold, but eventually they started laughing and the dog’s handlers began trying to recruit a group of bros who were walking down the boardwalk. Reluctant at first, they were won over pretty quickly. “We’re gonna be on Conan, dude!” They talked to the dog. At around two in the morning, with four hours left until the closing I tried to find a place in the casino to get a beer. People seemed to have drinks, but it wasn’t clear where they were coming from. Two women sat on the steps, holding plastic wine glasses and laughing. At what looked like it may have once been a bar, a man was watching the circle of televisions, all of them playing ads for missing girls. Striking workers at closing time.